As the current political environment in my country (among others) demonstrates, it is particularly difficult to have conversations about politics and social issues with people who hold views different than your own. These conversations are always challenging, but when people function in an echo chamber hearing their own beliefs from everyone around them (and likely in the media they consume), it’s even more difficult to offer a different viewpoint. Yet, reasonable discourse is an essential skill for strategic communications professionals, especially in this hyper-polarized environment. That’s why I coach University of Florida students in my graduate class in Public Affairs Communication to have reasonable conversations on contentious topics they are passionate about while respectfully responding to other points of view. We explore techniques to avoid having biases sink conversations with fellow students (or employees, customers and clients). Many students are not practiced in the techniques. Find common ground. Be aware how your words influence others. Ask for the basis for statements. Listen for information that helps you take their perspective on their actions. Somewhat to my surprise, this exercise has been an overwhelming success! I took the same approach more broadly in Beijing recently where I had the privilege of addressing 300 colleagues at the China International Public Relations Conference. My point—and a key takeaway I leave with colleagues across the world—is that our mission as public affairs and communication professionals is to build bridges for business between countries. Corporate Diplomacy is where business, collaboration, diplomacy and public affairs converge. It means a company embeds the value of collaboration deeply into its operations and practices, extending the reach of its relationships to include groups, cultures, organizations and government, which affect the sustainability of the business. 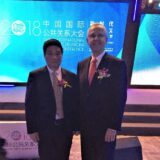 In Beijing, I found common ground with another speaker, Xu Zhengzhong, who is teaches at the Party School of the Central Committee of the Chinese Communist Party. Professor Xu is Deputy Dean of the school’s Institute for International Strategic Studies and Director of the International Organizations Institute. Backchannel diplomacy, the practice of non-governmental, informal and unofficial contacts and activities between organizations, private citizens or groups of individuals, is not a substitute for official diplomatic negotiation. Rather, it assists official actors in managing and resolving conflicts by exploring possible solutions outside of public view and without the requirements of formal negotiation or bargaining for advantage. As companies increasingly look for growth and revenue opportunities in emerging markets, frontier markets and foreign markets, corporate diplomacy becomes important. I was pleased to hear Professor Xu agree that corporate diplomats can help guide decisions and find solutions that last beyond political and emotionally charged rhetoric. These corporate diplomats are passionate about understanding cultures different from their own and bringing people together to solve problems. They are experienced negotiators, communicators and coalition builders. Public affairs and strategic communication professionals are uniquely positioned to be company ambassadors, bringing leaders together from opposing sides in interactive, off-the-record contacts to introduce “win-win” concepts, and creating interpersonal cohesion by building a sense of interdependence and need to work together. I agree with Professor Xu that Chinese-American cooperation is essential if the world is to weather another financial crisis, make progress on things like climate change and global supply chains. The bonds between our countries are deep and breaking them would be costly. We must do all we can to avoid unilateral actions that could trigger a crisis. Competition between China and the United States should not be a bad word. There are issues to work out, to be sure, but the world will continue to integrate, especially in manufacturing, communications, technology and travel. As strategic communications officers, we have a timely opportunity to lead change in the perception of our distinct cultures and people and in the practice of public affairs and strategic communications during these turbulent and unpredictable times. This requires inspired leadership from within the public affairs and communications profession. After all, we strategic communications professionals are living in a world that our profession is perfectly suited to serve. Robert Grupp is Director of the GlobalThink Series of Executive Roundtables, the National Summit on Strategic Communications, and he is Adjunct Instructor and Director of a Global Strategic Communication Master’s Degree Program in the College of Journalism and Communications at the University of Florida.